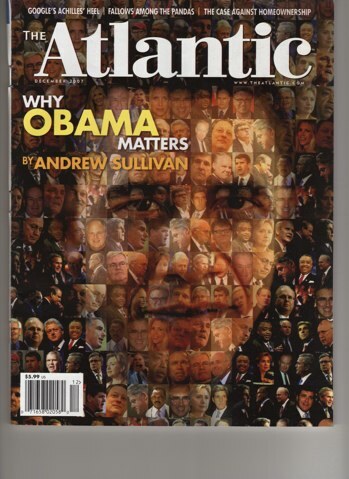 As I flew back from Vegas over New Year’s, I read Why Obama Matters, Andrew Sullivan’s cover story in The Atlantic (yes, that periodical and Vegas make no sense, but it was working for me). Maybe it was the altitude, but I was swept up in the writer’s case for this Obama Moment, a moment America would have days later in Iowa. It’s a great read* about the senator’s chance to push us past the paralyzing battles of the baby boomers and into something that looks like the future. And it got me thinking that Barack Obama really is very much the Personal Media Candidate. Obama is a master at personal media, using his gifts of oratory to electrify from above, and a massive social network to build his base of support from below. His “we” message reminds of many of the tenets of personal media, from peer to peer networking to the wisdom of crowds. And unlike so many politicians, the guy actually wrote a good memoir. Damn if we didn’t try to get his six-word memoir. But you can’t win them all. *And among the best issues of a print mag I’ve read in a while. Elsewhere in its pages, Bill McKibben writes the piece about the joys and genius of Internet radio I’ve been waiting to read; Michael Hirschorn dissects the “most emailed lists” of the dailies and lays out a plan for their print daily’s relevancy; and there are some very cute photos of pandas, too.